A land development investment specialist looks at an uneven housing recovery. “The findings of The Post’s analysis underscore another way in which the economy, despite its improvements over the past several years, continues to deliver better returns for some Americans than others. “You get there (Stockton) on Interstate 580, through 80 miles of suburbs and farmland, up into the bald hills of the Diablo Range that are suitable for neither. The highway, eight lanes wide, cuts through at the Altamont Pass, 1,009 feet above sea level. And then the hills part and California’s Central Valley comes into view: an unexpectedly flat landscape that feels very far from San Francisco, and where Stockton and its neighbors are still suffering the lingering effects of the worst housing bust in the nation. “During the boom years, the moving trucks brought over the Altamont Pass families that were priced out of increasingly expensive communities around the Bay. Hardly anyone moved in the other direction. Those households helped bring the housing fever with them: a $400,000 enthusiasm for $200,000 homes, a faith that $400,000 homes should become $500,000 jackpots. They brought demand for entire new subdivisions and communities built on former asparagus farms and almond orchards. And entranced by all the money the government reaped in development fees when those subdivisions were built, Stockton built a beautiful new arena downtown, next to a new minor-league ballpark, right by the site of a planned new marina on the inland channel that leads back out to the coast. “In San Francisco and Silicon Valley, incomes were rising during the bubble years. And the growing demand to live in the Bay Area was outstripping the supply of homes, pushing up prices. But the longtime agricultural economy in the Central Valley wasn’t taking off. Incomes weren’t rising as home prices were. And there wasn’t a shortage of housing. In the run-up to the bust, though, very different communities started behaving similarly — not just out here, but across the country, says Nobel Prize-winning economist Robert Shiller, who is credited with having predicted the housing crash when few others believed a bubble existed. We know that this ended extremely badly as the Central Valley got overbuilt and oversupplied, cities took on too much debt and Stockton became the poster child for the foreclosure crisis in the US once home prices collapsed under their own weight when the mortgage market imploded. The Bay Area’s housing market, on the other had held up relatively well through the bust years and then rebounded strongly on an epic run fueled by a resurgent tech industry fueled by a tidal wave of venture capital investment and lack of new housing supply due to restrictive zoning and politically powerful NIMBYs. Only this time around the recovery failed to move inland as prices increased in the Bay Area. This phenomenon is not limited to the Bay Area and the Central Valley. We’ve seen it up and down the state of California over the past several years where coastal markets have boomed and inland markets have stagnated. I decided to look at things from a bit different angle and take a look at relative pricing between markets. With help from our friends at Market InSite Real Estate Advisors as well as Steve Reilly who covers the Bay Area for Land Advisors Organization, we put together an analysis of home prices in coastal production housing markets vs. inland production markets to show how previously strong pricing relationships have broken down badly during the bust and subsequent (coastal) recovery. For the Bay Area vs. Central Valley chart, we used Dublin as the primary East Bay production market and Tracy as the secondary Central Valley production market. For the Southern California chart, we used Irvine as the primary coastal production market and Chino as the secondary Inland Empire production market. As you’ll notice above, we used resale data rather than new home. We did this because it’s a much more robust data set (there are a lot more resales than new home sales) and also because the product mix changes more gradually over time whereas the new home product mix can vary greatly as new neighborhoods come online and more mature ones sell out. It also allows us to look at price independently from other local issues like rising impact fees which could cause changes in the type of product that a builder needs to construct in order to turn a profit. However, this data is mostly applicable to the new home market as well, only the prices tend to be higher for new units. Unfortunately, our data only goes back 15 years. What’s striking about both of the above charts is just how much prices in the primary markets has moved away from the secondary markets in the wake of the housing bust. 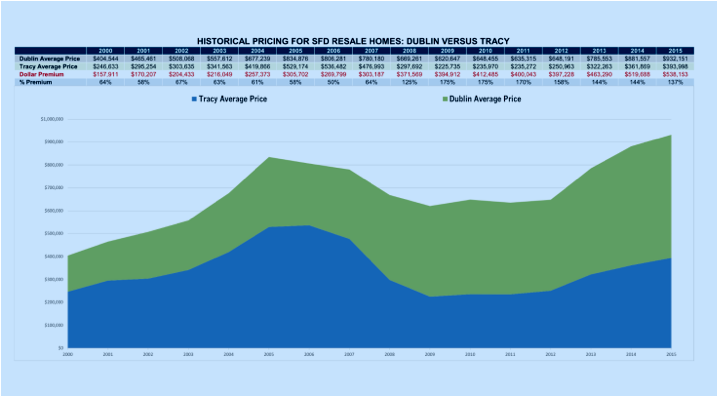 Before 2008, Dublin achieved a fairly consistent premium of between 50% – 75% over Tracy. Once we hit 2008 and the foreclosure crisis mounted, that premium rose to 175% and has since settled in the high-130%s to mid-140%s over the past few years. Dublin is now nearly $100k above its prior peak pricing while Tracy is over $142k below its peak. Almost the same thing happened in the Irvine vs. Corona chart where Irvine was historically 60% – 90% more expensive than Corona before 2008. At that point, the pricing relationship broke down, widening out to 186% in 2012 before tightening back to 136% today. 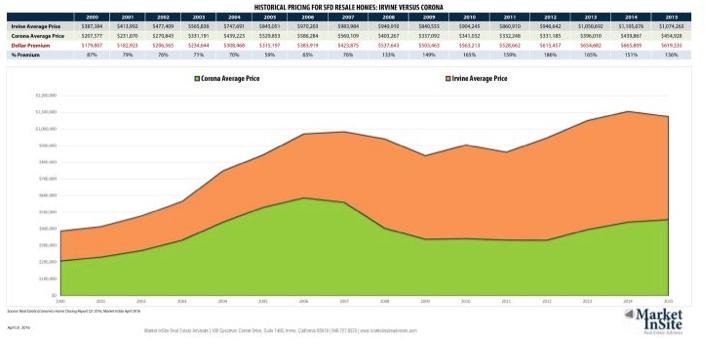 Irvine has exceeded its prior peak by $90k while Corona is $131k below its peak. In the past, prices this high near the coast would lead to a building boom in the secondary markets as workers look for more affordable options, leading to housing starts, new jobs and rising wages in those markets. In other words a virtuous economic cycle. That hasn’t happened this time around though as the primary markets have continued to outperform. While primary markets often get a lot of attention, the real increase in housing starts usually comes from the secondary or production markets. Why? Because land costs are far lower allowing builders to construct housing that a larger subset of the population can afford. In other words, if the secondary markets remain weak, it’s very difficult for home builders to achieve substantial volume when it comes to starts and sales. We are well aware of the anecdote that “when Orange County catches a cold, the Inland Empire gets the flu.” I’m sure there is a similar saying up north. Several investors have voiced this concern recently citing seemingly overheated primary markets as a reason to avoid investing in the secondary markets. IMHO, the flaw in that logic is that the secondary markets never actually recovered from “the flu” this time around. They didn’t follow the primary markets up and they could represent a good relative value play if primary market prices and rents stay elevated. 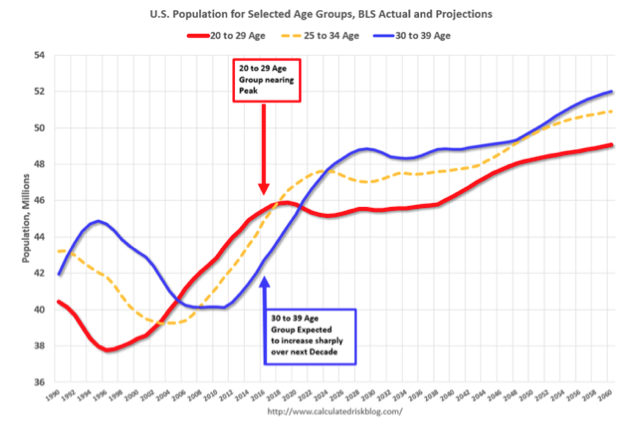 The coming demographic expansion in the 30-39 age group that will last until roughly 2030 could provide a tailwind in secondary markets as well. Landmark Capital Advisors, a real estate capital advisory firm disciplined in finance and private equity, works with owners, investors, and developers of commercial and residential real estate.